Why do great movies like Gattaca bomb at the box office while drivel like Avatar earn way more money than they deserve? I guess the film business is a lot like high school. The smart, nerdy films get ignored while the dumb, flashy movies get all the popularity. Wow, did I just complain about my childhood in a review of Gattaca? Way to start out this review with dignity, Deja Reviewer. What I’m trying to say is I love Gattaca. It’s everything I want in a slow-moving science fiction movie. It’s 10 times better than 2001: A Space Odyssey, 100 times better than Avatar, and 1,000 times better than A.I. Artificial Intelligence. We’ve got a lot to cover in this article, so let’s put on our rubber gloves and try to get to the nucleus of this ingenious film. First of all, I’ll give a quick plot rundown, in case you’re unfamiliar with Gattaca. In the not-too-distant future, children’s genes can be predetermined before they are born. However, two parents decide to have a child naturally and a son Vincent Freeman is born. The doctors already judge him as inferior from the moment he’s born. The parents think they’ve made a mistake, so they have another son who they name Anton, after his father. The boys are big rivals, and Anton seems to be superior in every way to Vincent. However, one day Vincent beats Anton in a swimming race and then runs away from home. He faces deep prejudice when trying to find a job. So he assumes the identity of a genetically perfect man, who is no longer able to use his legs, in order to get a job at a company that routinely sends people on space voyages. Along the way, Vincent falls in love with a woman who is supposedly inferior to him. Unfortunately, someone murders the commander of Vincent’s mission just a few days before he’s scheduled to leave for Saturn’s moon Titan. The murder investigators keep getting closer to discovering Vincent’s true identity, but they eventually realize he’s not the killer. Happily, Vincent makes it into space where he faces an uncertain but hopeful future. This just scratches the surface of what makes this movie great. So now let’s delve into the details. It’s frightening how plausible Gattaca’s world is. It simply takes humanity’s quest for perfection to its logical end. As the doctor explains to Anton’s parents, they could never have a child with the right combination of perfect genes, even if they had 1,000 children. Wouldn’t every parent jump at the chance to have a child prodigy? But if everyone could do that every time, would those children actually be exceptional or would they just become the new normal? And what about parents who couldn’t afford to have that procedure? Would that become a new right so the government would have to pay for every child to be genetically perfect? That would certainly save on health-care costs and ensure a stronger, smarter population. Why not? That’s the question this movie constantly asks: Why not? The answer is simple: Because you can’t judge a person based solely on their genes. Randomness is part of being alive. Yes, we have certain strengths and weaknesses that our parents give us, but we also have our own willpower to overcome challenges and achieve greatness. What if scientists had discovered that the combination of genes that would produce Beethoven would lead to deafness? They probably would have selected a “superior” combination, but they would have robbed the world of one of the greatest composers who ever lived. Gattaca offers a twisted version of Dr. Martin Luther King’s famous vision: “I have a dream that my four children will one day live in a nation where they will not be judged by the color of their skin but by the content of their character.” There is no prejudice against people of color in this film, but there is plenty of prejudice against people who are nevertheless judged to be inferior. They argue that they are actually judging people on something meaningful – their genes. If you can tell how likely a person is to die of a certain disease, you know whether or not it’s smart to offer them life insurance. If you know how intelligent a person is likely to become, you know whether or not to offer them a certain job. However, this is not judging people based upon their character or even their abilities but on their potential. It’s still quite foolish, even though it might be grounded in science. Are we destined to become great? Do we have any say in the matter? Could someone who is meant to be a great leader fail to live up to his potential? Of course. On the flip side, could someone who is, by all measures, meant to be mediocre accomplish something stupendous? Definitely! That’s because there is no way to measure true greatness. For example, you can judge a filmmaker on how many films he makes, how much money each one earns, and how many awards he earns. But if you do that, you might fail to notice filmmakers who produce a small number of personal films that mostly fail at the box office, but become cult classics. Calvinism, to me, has never made any sense. Why would God select some people to be good and others to be evil? That would make Him responsible for all the sin in the world. Why would He be divided against Himself and force some people to disobey His commandments? It’s ironic that, at least in this film, scientific progress could lead to a Calvinist dilemma. In order to become truly great, Vincent can’t afford to have a fallback plan in case something goes wrong. A genetically perfect man named Jerome Morrow offers to allow Vincent to assume his identity. When Vincent learns about this through a black-market salesman, he promises to dedicate 100 percent to the challenge. The salesman replies curtly, “That’ll get you halfway there.” Vincent already knows this, though, because he used this knowledge to his advantage against his brother Anton. When they were children, they used to race each other out to sea until one of them got scared and turned back. Anton beat Vincent every time until one fateful day when Vincent pushed himself beyond his abilities and finally beat Anton. That moment made everything else possible. Later, Vincent admits that the way he beat Anton was by not saving anything for the trip back. The same is true of his whole life and his preparation for the space flight. He’s spent his whole life preparing for a year-long mission to Titan, and he doesn’t expect to return alive because he’s already past the age he should have died at, based on his genetic predispositions. The most interesting character in the movie is Jerome Eugene Morrow. After Vincent assumes his identity as Jerome, the original Jerome usually goes by his middle name, so I’ll do the same to avoid confusion. Eugene shows us what a society obsessed with genetic “perfection” eventually does: it becomes self-destructive. After growing up knowing that he is the perfect specimen to become the world’s No. 1 swimmer and training fiercely to reach this prize, which he thinks should rightfully be his, he fails. He comes in second place. How is that possible? Because society has become one big cheat. He wasn’t given his incredible talents through God’s good grace or through a fantastic coincidence. He is the ultimate example of stacking the deck, and he knows it. This realization pushes him to try to kill himself by jumping in front of a car, but once again he fails to accomplish his goal. He survives the collision, but now he’s a paraplegic. He still acts superior to Vincent and tries to convince himself he’s better than everyone else, but he’s really just lonely and lost. The movie spends a lot of time trying to convince us that it doesn’t matter that the actors playing Vincent and Eugene don’t look alike. For the record, I think that’s the weakest aspect of this movie. I mean, couldn’t the casting director have tried a little harder to make it plausible that people could actually mistake Vincent for Eugene. I’m glad they didn’t go for the whole long-lost-brother angle to the story like so many other films do. But no one could confuse Ethan Hawke with Jude Law. They’re too distinct. I know, they explain that people don’t even look at photos anymore, and they only see what they want to see. But come on. Doesn’t plastic surgery exist in the future? For all my harping on the topic of Vincent imitating Eugene, there is one thing I really like about it. Vincent discovers, to his horror, that he’s a few inches shorter than Eugene (by the way, isn’t it refreshing to see a futuristic movie that doesn’t use the metric system?). So he has to get his legs surgically stretched in a painful process that lasts several days. Now that’s dedication. This shows the lengths (no pun intended) Vincent is willing to go to in order to make his dreams a reality. How does it feel to constantly have to live up to the potential everyone says you have? 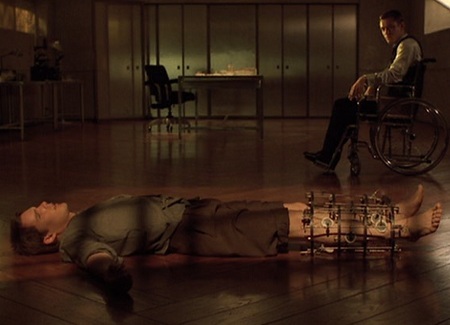 The world of Gattaca seems to be consumed by fear. Not fear of the unknown, but fear of failure. Vincent is afraid of being revealed as the fraud he is and being barred from his space flight. But strangely enough, I find his fear to be much more manageable than everyone else’s – everyone who is supposed to be genetically perfect. They all carry unbelievable burdens. Anton and Eugene are both afraid of being inferior in any way to a genetically flawed person. They have been taught since they were children that they are superior, so it’s a terrible shock when they discover their own weaknesses. Their fear seems to push them, but it’s not enough to help them overcome their problems. They eventually give in to their fear and give up. 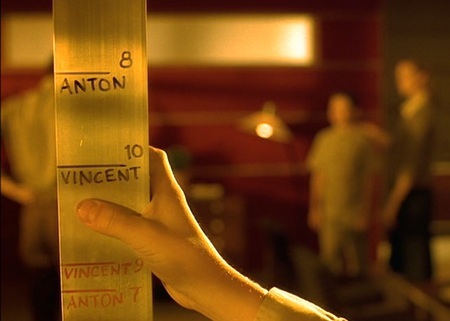 I briefly mentioned Vincent’s romance with one of his coworkers at the Gattaca Corporation. They have an ironic relationship – so much in common and yet so much separating them. Vincent is hiding his imperfections behind a disguise while Irene Cassini, the woman he loves, is forced to deal with the consequences of having a minor imperfection in her genes. She’ll never be able to do all the things she dreams of doing because she’s been deemed unfit for those responsibilities. She looks up to Vincent like he’s better than her in every way, but she doesn’t know that he looks at her in the same way. As their love grows and they’re forced to reveal all of their secrets to each other, Vincent and Irene become something greater than they could be by themselves. Again, this goes back to the argument that we could somehow be judged purely by our genes. This romance is clear evidence against that idea. I’ve discovered in my own life that having someone to confide in and to believe in me helps me be willing to take risks with greater confidence, so I am able to surpass artificial limitations I might have otherwise placed on myself. The same is true of Vincent. Even as he fears losing Irene forever when he leaves for Titan, he still finds the courage to press forward because of her love for him. In the final scene, just as Vincent boards his spaceship headed for the stars, Eugene forms a new resolve to die with dignity. He had squandered his chance at greatness because of his pettiness. Instead of being proud that he performed a feat few people could ever hope to accomplish, he focused on the triviality of not being first. He used to think that he shouldn’t continue to exist because he’s not the best in the world in his field. But finally at the end, after seeing someone far weaker than him sacrifice everything and rise so high, he understands the hypocrisy of the world around him, and he refuses to be a part of the lie anymore. He puts on his silver medal, climbs into an incinerator chamber, and proceeds to burn himself to death. Despite the tragedy of this moment, I see it as a redemption. Eugene has finally come to terms with his loss, and he decides to wear the symbol that he used to hate with pride as he finishes what he started with the car collision. 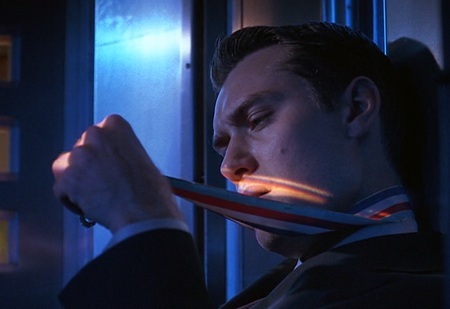 Gattaca is an incredible movie to watch. It’s almost a satire of other Hollywood films that present perfect physical specimens as everyday occurrences. It shows the hollowness of such a world and the inherent flaws of striving to produce flawless people. There will always be injustice as long as people have different strengths and weaknesses that can be taken advantage of. And there is no such thing as predestination. We have plenty of say in who we turn out to be. After we make it through high school, that is. Oops. There I go again. 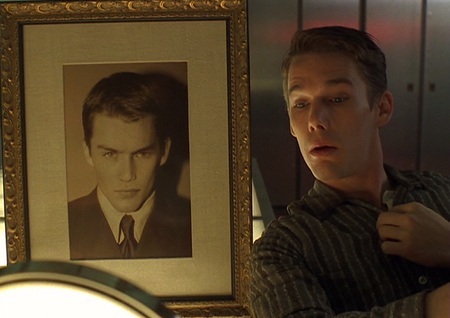 All images from Gattaca are the copyright of Columbia Pictures. This entry was posted in Forgotten Film Gems and tagged 2001 a space odyssey, avatar, calvinism, discrimination, dna, drama, ethan hawke, films, gattaca, genetics, jude law, love, martin luther king, message movies, movie review, movies, politics, predestination, relationships, religion, romance, science, science fiction, space, space exploration. Bookmark the permalink.